H) specialized databases and archives on such topics as census data, environment, and health; I) a (then forthcoming) Grants Directory under the editorship of Itty Abraham (a Social Science Research Council program director). As of October 1994, David Magier characterized SAG as "still in its infancy" and also promised additional forthcoming resources "created locally or by groups of South Asianists." By September 1996, the South Asia Gopher was transitioning into the web accessed version of SARAI, and had shifted from a period of "collection development" to "classification" and "annotation" stages of work. This was part of a broader Asian Studies Online Library project by the Association of Asian Studies' "fledging effort to coordinate evaluation, selection, classification and annotation of small select sets of 'peer reviewed' internet resources for inclusion" into what might approach the functionality of a library (see H-ASIA, September 4, 1996). A "preliminary peak at the (very) raw lists of S.Asia materials" Magier had been collecting for SARAI as of 1996 was available at David Magier's South Asia Bookmarks [only the banner remains at the archived site; the bookmarks themselves were shifted to newly launched SARAI]. 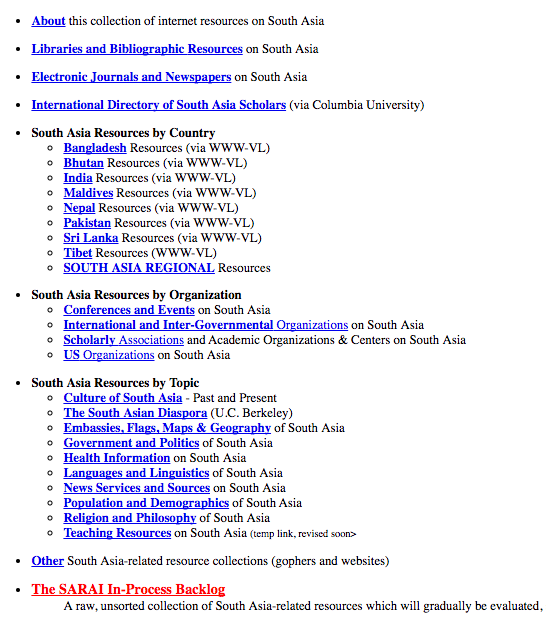 On December 6, 1996 the South Asia Resource Access on the Internet (SARAI) site was announced on H-ASIA with url http://www.columbia.edu/cu/libraries/indiv/area/sarai [banner image no longer archived; scroll down to see the links]. On August 15, 1997, the University of Chicago Library (in collaboration with Columbia University Libraries) submitted a two-year pilot project proposal to the Association of Research Libraries' (ARL) Global Resources Project (funded by the Mellon Foundation) which conceived the Digital South Asia Library(hosted at the University of Chicago) and SARAI (hosted at Columbia) as two complementary resources linked to other global participants in Madras, Hyderabad, and other locations. Jim Nye, Bibliographer for Southern Asia at the University of Chicago Library, and David Magier demonstrated this ARL South Asia Project at the October 1998 CONSALD meeting (Committee on South Asian Libraries and Documentation). In October 1999, United States Department of Education awarded the South Asia Project with $1 million in grants for three years ("South Asia Project Funded," American Libraries, 30(9), p. 36, October 1999). SARAI continued to be developed through 2010. The challenges of sustaining an up-to-date web portal, the evolution of the web, and the changing nature of search and discovery of online resources led to the decision to discontinue SARAI. In 2017, the Global Studies Division of Columbia Libraries retired the SARAI website from its servers. Much of SARAI's web presence has been preserved through web captures done for the most part by the Internet Archive between 1996 and 2017. Previous incarnations of SARAI can be explored at the Internet Archive links listed below. Many of these web captures may not go deep enough to include the full websites to which SARAI pointed but one can see what was listed and how the SARAI web directory was structured. We hope this history of SARAI will be helpful to researchers interested in the early development of subject portals, especially in the field of area studies.